Developer Quote: "InstaCollage helps you combine multiple sized photos into one beautifully framed picture & unique collage with caption in seconds and share your masterpiece to Instagram,Facebook, Twitter and Flickr very easily!" It may seem a bit late, but I am just now jumping on the Instagram bandwagon. It's different to Pinterest with no web platform or organization strategies, but there are many Instagram apps that make this "culture" highly appealing. One such app is InstaCollage Pro - Pic Frame & Pic Caption for Instagram FREE. 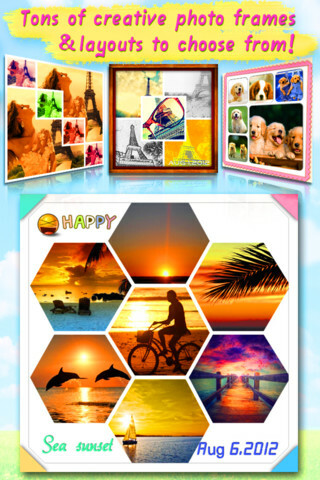 - 17 very cool irregular frame layouts for collage! Unique! It's easy as cheese to create a stunning pic with InstaCollage. Launch your app, scroll along through the picture frames at the bottom of your display to get a color and design you like, then pick the one with the correct number of slots for your pic. Now tap the slots to add your pics by camera or from photo album, add FX from an array of 18, add colored text to on your photo (loads of fonts, colors, sizes) and put cute stickers on too, if they match the theme of your pics. Ta Da! I have simplified the process as I promise there are tons of cool tweaks you can enjoy with your frame, photo, sticker and caption sizes. Finally, you can share to Facebook, Twitter, Flickr, Instagram, save to your camera roll or send by email. No bragging on my part, but I have become fast at this procedure and can turn out several unique pics at a time (providing I have some good photo material, of course)! In any event, I recommend you find your friends on Instagram (we are cooliphoneapps1), start creating some amazing collage stories, and add yet another enjoyable hobby to your growing list of artistic mobile apps! 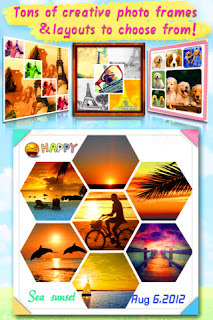 COOL CONCLUSION: With InstaCollage, create gorgeous, color-tinted photos complete with snazzy captions, stickers and lovely frames in Instagram style that make a story out of your imaginative collage.